Meggle Tangle : Zendala Dare #73, Lamp Inspiration, and Back to Work for Me! Zendala Dare #73, Lamp Inspiration, and Back to Work for Me! Here is my first of two submissions for the Zendala Dare #73. I bought some gel pens and was really excited to use them. It's a bit overboard . Colour can be great, but it's another dimension to consider. My husband calls this the "Flower Power" Zendala. Using my iPhone I changed the colours to Sepia and then to Black. The simpler basic colours create a nicer end product. Here is my second submission for the Zendala dare. There was a lot I liked about my first Zendala that I tried to recreate in this one using black and silver gel pens. This one has a tribal feel to it that I tried to preserve throughout the whole piece. This drawing is based on the lamp in my living room. This is my last week of my maternity leave! I start work October 1, and I'm also going to be studying for my registration exams. Possibly I'm spending extra time on Zentangle this week knowing I'll not have the time to dedicate to Zentangle as I have over the past ten months. It's going to be an interesting change. I'll be learning to be a working mother and to find balance in my new role. I hope I also stop feeling guilty for dropping my son off at daycare! 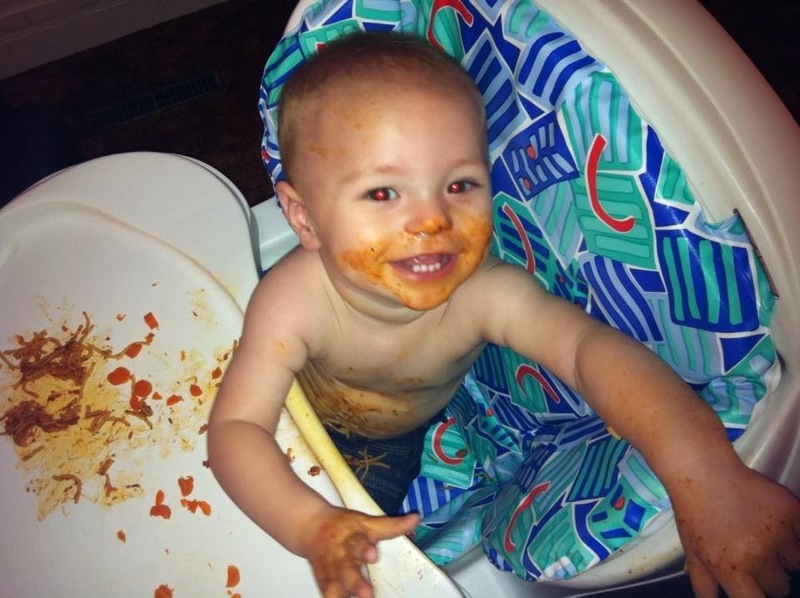 Here's my little monster with his own form of art entitled "Spaghetti and Meatballs Extravaganza." A lovely collection of drawings, Meghan. And don't feel guilty about letting your 'little monster' socialize! You both need the space. Thanks Faith :) This is what I keep telling myself. Wonderful zendalas! Very nicely done! I think that color and the traditional B/W have their unique positives. I really like the last one.